Woodrow Wilson entered Princeton as a member of the Class of 1879. “Tommy,” as his classmates called him, was an eager student and an acknowledged leader. Not satisfied with the courses offered by the College, he supplemented the formal curriculum with an ambitious program of independent reading. Still feeling less than fully occupied, he became managing editor of the Daily Princetonian and organized a student club for discussion of public affairs. His classmates elected him speaker of the American Whig Society, one of two principal campus groups. Pursuing athletic interests, he became secretary of the Football Association and president of the Baseball Association. After graduation, he went to law school at the University of Virginia and practiced in Atlanta. Disillusioned by the tedium and materialism of legal damage suits, he enrolled in Johns Hopkins for graduate work in political science and history. His doctoral dissertation, “Congressional Government,” led to teaching positions at Bryn Mawr, Wesleyan, and finally Princeton. When the trustees elected him president, Wilson proposed a $12.5 million program to transform Princeton into a full-scale university. At the time this was a staggering sum, almost 25 times greater than the annual budget, but the trustees approved it immediately. He began by creating an administrative structure — departments of instruction with heads that reported directly to him. In place of the aimless elective system, he substituted a unified curriculum of general studies during the freshman and sophomore years, capped by concentrated study in one discipline (the academic “major”) during the junior and senior years. He also added an honors program for able and ambitious students. Wilson tightened academic standards so severely that enrollment declined sharply until 1907. Supported by the first all-out alumni fundraising campaign in Princeton’s history, he doubled the faculty overnight through the appointment of almost 50 young assistant professors, called “preceptors,” charged with guiding students through assigned reading and small group discussion. With a remarkable eye for quality, he assembled a youthful faculty with unusual talent and zest for teaching. In strengthening the science program, Wilson called for basic, unfettered, “pure” research. In the field of religion, he made biblical instruction a scholarly subject. He broke the hold of conservative Presbyterians over the board of trustees, and appointed the first Jew and the first Roman Catholic to the faculty. Before the end of his term, he authorized fellow members of the Class of 1879 to cast two heroic bronze tigers for the front steps of Nassau Hall. (Tigers appeared as mascots during McCosh’s tenure.) After modernizing the administration, the curriculum, and teaching methods, Wilson proposed the creation of quadrangles, or “colleges,” in which undergraduates of all four classes would live with their own recreational facilities and resident faculty masters. Membership would be by assignment or lot. Twenty-five years after his death, the trustees named the School of Public and International Affairs for him. Sixty years after the defeat of his “quad plan,” they carved out an area of the campus — six dormitories and a dining and social center — as a distinct residential complex known as Woodrow Wilson College. The trustees also created the Woodrow Wilson Award — the highest honor the University bestows upon an alumnus in recognition of his or her distinguished public service. 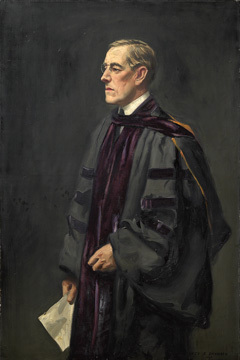 Woodrow Wilson (1856–1924), Class of 1879.